The NYTimes on Italian Tomatoes. This is Colossally Important. This is the biggest moment yet for Gustiamo. For over a decade, we have been telling — NO. SHOUTING — the story of Italian tomato fraud. 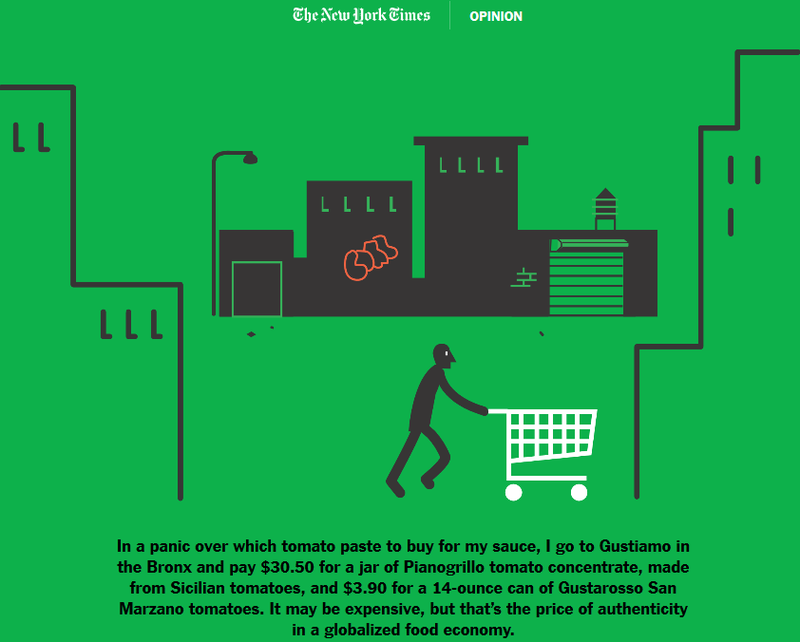 We are so proud to share “The Mystery of San Marzano Tomatoes,” just published in The NYTimes. So damn proud. Through a series of vignettes, the brilliant, creative, and inquisitive Nicholas Blechman tells the story of Italian tomatoes. His graphic article shows how the Italian tomato tradition is being disastrously appropriated and cheapened. This is the final infographic of his story. It’s the Gusti Warehouse!! We are Gustiamo. We represent Italian authenticity in our globalized food economy. We share real Italian food culture. We help Italian food artisans and farmers maintain their livelihoods. This is our passion. This is why we exist. Next Post Why Buy Real San Marzano Tomatoes?